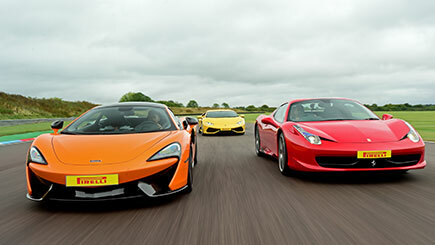 There's no place better than Thruxton, the UK's fastest track, to test four of the world's most incredible supercars: the Ferrari 458 Spider, the Aston Martin V8 Vantage N430, the twin turbo V8 McLaren 570S and the Porsche Cayman. Begin with a safety and race driving briefing by a senior instructor, before receiving three familiarisation laps to ensure drivers get comfortable with racing lines. Then take the wheel for three stunning laps in each car around the rapid 2.4 mile circuit. With a total of around 30 unforgettable miles, drivers will be able to decide which of the Ferrari, Aston Martin, McLaren or Porsche is their favourite. This driving day will take your breath away. Selected weekdays between February and November. Dates fill quickly, so please allow at least six weeks' advance booking notice. Available to book from January 2018. Expect to be at the circuit for three hours, including a briefing, demo laps and over seven miles driving each car. Please arrive a few minutes in advance of the booked time to ensure a prompt start. All in-car tuition is on a one-to-one basis although briefings may be shared. During familiarisation laps, up to three people share a car.